Are you ready for some football? I am! I live in Maryland and so we are, of course, rooting for the Ravens to win. Although, I will be happy with either team winning--after all, it is still in the family, right? Wether Jim or John wins they still have an amazing story to pass on and talk about down the road. Our culture loves football and food...dips, pizza, nacho's, sliders, chips, etc.... We love a reason to get together and to celebrate with friends and family, especially if it envolves a flat screen TV. My neighbor told me yesterday that he and his wife just purchased their first large flat screen TV. His eyes lit up with pride as he talked about watching the game in his living room. I was so happy for them. We will also be gathered upstairs around our TV as a family enjoying the big game. This appetizer will be served. I enjoy Oriental Chicken Salad. This salad is a great way to use our teams color--purple. I used purple onion and purple cabbage. You can use green cabbage, but for this day, we will use purple. This is just one of many recipes being shared with Sunday Supper, please take a few minutes and browse through the recipes that are at the end of this post. I know that their are some winners and favorites being shared today. If you are not a football fan, that is okay too. 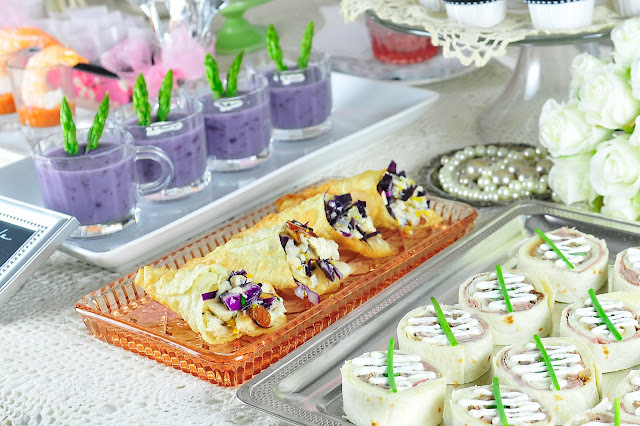 This appetizer works well for baby showers, bridal parties and birthday events. The cones can be made up in advance and assembled right before they are served. Get creative with your filling for the cones if the Oriental Salad is not your choice--you can use cheese, a different salad, mousse or tuna tartar. Best of luck to the Ravens and 49er's, regardless of who wins, I just hope it is a good game to watch and I know that spending time with my family will be the highlight and instant replay that I will look forward to with each passing year. The step by step instructions for the Wonton Cones can be found HERE. Combine dressing ingredients and shake well. This is a basic recipe and can be adjusted to your sense of taste by adjusting the sweet/tart levels with more or less sugar or vinegar. Combine chicken, cabbage, chives, oranges,pineapple and almonds. Add dressing and combine. The dressing should be tasted and enhanced to your liking. We like ours a bit tart so I tend to add a bit more vinegar than what is listed. This can be made up to 2 days in advance. If served in cups they can be prepared the night before. 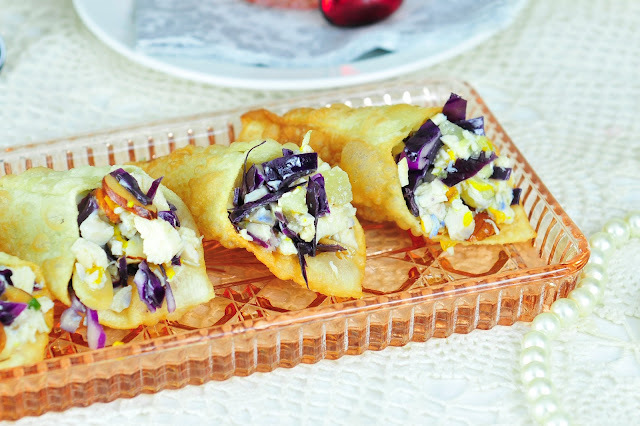 If serving them in a wonton cone or pastry shell, prepare the day of the event. Filling can be served cold or warm. Chicken in Passion Fruit Crunch from The Urban Mrs.
Vegan “Hamburger Helper” Soup from What Smells So Good? Now that is one feast for sure! I’m sure you found a whole bunch of recipes to make for your next party. Be sure to bookmark this post so you can reference it easily. It is a keeper list for sure. What is your favorite party food? Is there one you always make when entertaining or to take to a party? I have several and these muffuletta skewers are in my make often list along with pimento cheese balls and stuffed mushrooms. I’m so ready for a party, how about you? What a delicious and colorful appetizer. Your table is gorgeous too. I want to dive right in to all the goodies on it. I am so loving this appetizer! The flavor combination is wonderful!!! Going to check out the recipe for the cones! Wow! What a fantastic spread! The cones are such a pretty presentation - the oriental chicken salad inside sounds amazing! Oh man these wonton cups look addicting! Wow, what a great post and recipe. Love how you did the little cones. I have to try this one!! These are gorgeous! Love the wonton cones...I can't wait to try them! Your entire table is just stunning and these wontons look to die for. The recipe looked so good. Have everything in the house so will attempt it tomorrow but serve on lettuce as the wontons look difficult. Copied and pasted it. Those are gorgeous. I have to try these!!! These are GORGEOUS...I would love these! Your pictures are beautiful!! Love these ! stuffing and all ! Yumm !! These look very cute! They must also be delicious and flavorful. Great recipe! Oh these are so cute, you are right I think these would go down really well at a baby shower. And that salad sounds like it would be a perfect healthy pack lunch idea.